One of the joys of living in Lynden, Washington, is that it does not take a green thumb to grow gorgeous flowers. The climate is perfect for gardening, and while we have very little garden area of our own we do have a spectacular rose tree just outside of our patio area. I took this photo a few weeks ago. Right now the tree has three major stems with 10-15 blossoms on each tip...they look like 3 bridal bouquets growing on one tree. 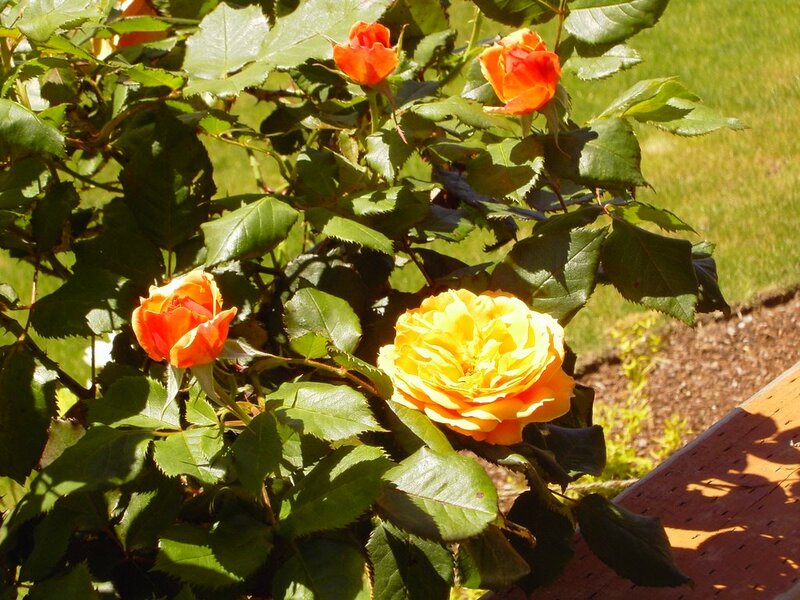 The roses are called "About Face" with petals that are golden-orange on the inside and bronzy-red on the outside. They look like flames all over the tree. I wish I could send you all a bloom but this will have to do. During my last two years of college my friends and I rented a house just off of campus that belonged (at one time) to the very elderly grandmother of one of our guy friends. 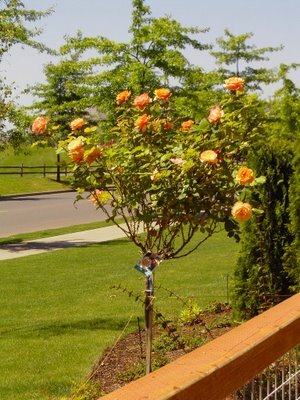 She must've had a passion for roses as there were beautiful rose bushes surrounding the big front porch. We all tried our best to keep them alive and coming back....though none of us had a green thumb! We had rose bouquets above the sink all summer long.